This week we are featuring Christina from Bolingbrook, IL! Christina is styling with our ‘Oh So Studly’ Black Bowler bag. We love how she has kept a black and white theme throughout her entire outfit, which pairs perfectly with our black studded bowler bag. The studs on the bag and the fringe on her necklace bring a little edge to this polished look. Christina is working woman who is constantly on the go with her job! She needs a bag that is versatile, stylish, and large enough carry both work and personal belongings! I think she has found the perfect fit! Thanks Christina, you look fabulous! Meet Christina! 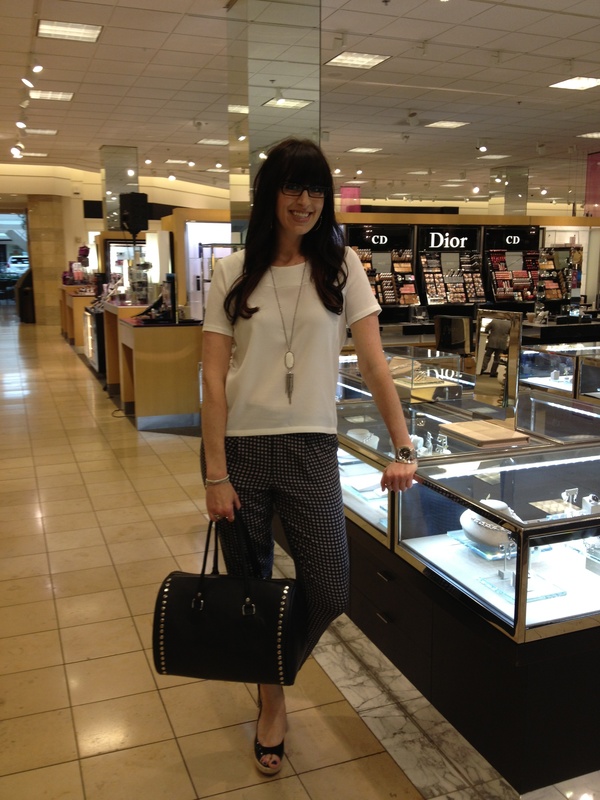 She is the Midwest Regional Merchandiser for Jewelry at Nordstrom and she has clearly accessorizes our black bowler bag perfectly! Thanks Christina, looking ever so fabulously chic! The Moroccan Handbag: For the Girl-on-the-Go!